"What I say and what people hear aren't always the same thing." Can anyone really remember the last time Demi Moore opened and carried a movie based on her own star power? For those curious you must look back some ten years, to a time of parachute pants and Milli Vanilli albums, to locate her last successful film. There have since been other hits, though each film had the benefit of having a hugely popular male star (Redford, Cruise, Douglas) to help carry the picture. In The Butcher's Wife Moore again fails to make a film successful on her own merits as this, too, is the cinematic equivalent to a low fat, low carb, low sugar meal. It has much going for it, though once consumed it obviously lacks any sort of flavor, and is ultimately unfulfilling. Moore plays Marina, a clairvoyant who, after viewing what must be the love of her life, rushes to the banks of the ocean only to discover that her dream man is a hefty New York butcher named Leo (Dzunda). Convinced that there is a meaning to everything, Marina moves to New York with Leo and, after the standard montage of shots establishing the Big Apple, she moves into Leo's apartment and helps out with his business. Things seem to go well for Leo: his wife is beautiful and business is booming; but after Marina starts to give complimentary advice to the patrons of the shop, she causes the business of a neighboring psychiatrist (Daniels) to drop. Leo, who becomes curious about his new wife's powers, visits the psychiatrist and after introducing the two, it is obvious that Leo may not be the one for Marina after all. As if stealing page after page from the "How to Make a Perfect Romantic Comedy" cookbook, screenwriters Ezra Litwak and Marjorie Schwartz seem to be convinced that convenience is in fact what brings lovers together. Soon after realizing that his bride is falling for Daniels' character, it is apparent from the second Leo makes eyes at a school teacher, played by Marry Steenburgen, that these two will wind up together. Perhaps it is the fact that everything that can be done in a romantic comedy has been done, but just once I would love to see a by-the-book screenplay take at least one or two chances. To be fair, The Butcher's Wife does have the intriguing premise of introducing a single character to a group and seeing the lives of everyone involved change from the inclusion of this person. It is an interesting development that should have been studied more by the filmmakers instead of presenting these predictable relationships and characters. As has become the case in Hollywood, the romantic lead in a film opposite a beautiful actress must be thin, handsome, and well-spoken, because who would want to see this beauty with a beast? This school of thought is on display in The Butcher's Wife, as the good-natured and likeable Leo is cast aside by Marina in favor of the more attractive psychiatrist. As if to say that good looks are a necessity, the picture forgets its own notion, spoken at the start of the movie, that love at first sight is possible. Instead, the final romantic pairing seems to say that love at first sight is nice, but when love at second sight involves a good-looking doctor, then hey, why not think differently. The performances by Moore and Daniels work well and the two have chemistry together. I have never denied the fact that Moore is a talented actress, it is her choice of projects that hampers her ability to showcase what she can do. Dzunda (Crimson Tide) is fine as the loveable Leo, and supporting performances by Frances McDormand and Max Perlich (Beautiful Girls) are criminally underused. Image Transfer Review: Presented in a 1.85:1 anamorphic transfer The Butcher's Wife looks better than I expected a 10-year-old film to look. Devoid of any print flaws or scratches, the image still suffers from a soft look that makes it obvious that the Greenwich Village depicted is a set. Aside from those source issues the transfer is fine, though not spectacula,r as many recent Paramount efforts have been. Audio Transfer Review: The Dolby Digital 5.1 mix for The Butcher's Wife is largely uneventful with dialogue taking command throughout the film. The center channel sounds clear and well-defined, while the score by composer Michael Gore sounds natural and full across the left and right speakers. Both English and French Dolby Surround 2.0 mixes are also provided. Extras Review: The theatrical trailer is the only extra feature offered. 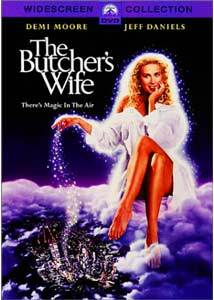 The Butcher's Wife is a film that is littered with faults, though for the numerous romantic comedy fans around, it may well fit the bill. I was unimpressed with nearly every aspect, but there is no denying that there are others much worse.